ANOTHER CONVERT TO CHRISTIANITY BEHEADED IN SOMALIA…….. – The Tundra Tabloids……. 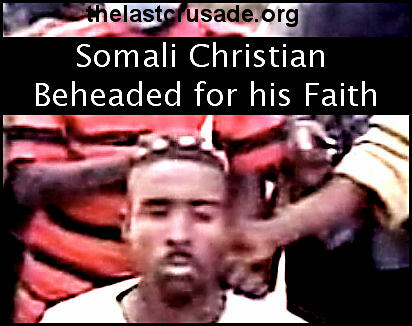 ANOTHER CONVERT TO CHRISTIANITY BEHEADED IN SOMALIA…….. Same as they did to the man in the picture below. Converting to Christianity from Islam is a capital offense for the followers of the desert madman named Mohamed. Now keep repeating that mantra, Islam is a religion of peace…Islam is a religion of…..
NAIROBI, Kenya – Islamic extremists from the rebel al Shabaab militia in Somalia beheaded a Christian on the outskirts of Mogadishu last month, sources said. Previous Post Previous Post INTERPOL BECOMES SHARIA ENFORCERS FOR THE SAUDIS……..
Next Post Next Post SARAH PALIN: ROMNEY IS NO CONSERVATIVE…….